Can you remember spotting an Audi in the following films? Audi cars have been featured in many movies over the years. Did you spot one in these films? Thought by many to be the most successful movie franchises ever to be created, the Marvel Cinematic Universe has different movies for everyone. There have been 21 films released already — the most recent being Captain Marvel — and at least a dozen more in the pipeline. You don’t only enjoy the action in these films, but you may also be able to spot a stylish Audi, too. 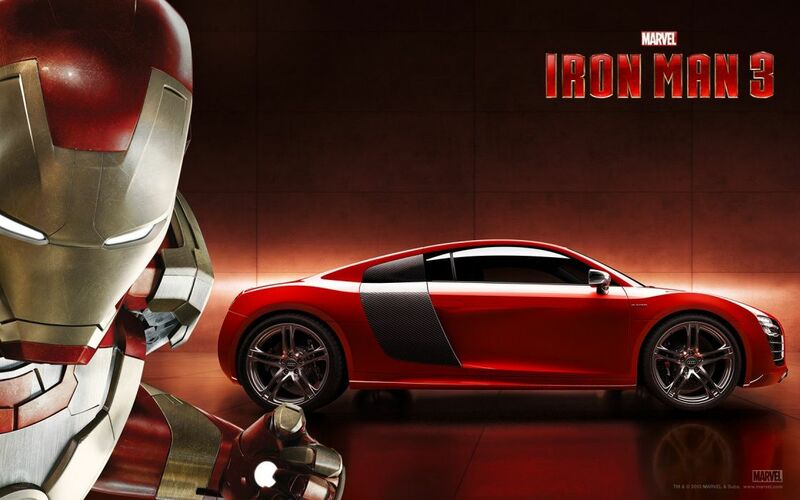 When it comes to the Iron Man trilogy, at least one Audi has been featured in every film! A 2007 R8 and S5 B8 can be found in the first movie, a 2009 A8 LD3 and 2010 R8 Spyder are spotted in the sequel, and a 2012 S7 and R8 e-tron are both featured in Iron Man 3. The R8 e-tron also turned up at a VIP screening of Iron Man 3 at London’s Leicester Square a few days before the movie’s general release. Another Audi fact is that there were almost as many Audi cars in the three Iron Man movies as there was in one Captain America film (Civil War). Within its two hours and 27 minutes runtime, you can see the 2017 Audi R8 V10 Plus, the 2017 SQ7, the 2017 A4, the 2016 A7 Sportback and even the Audi prologue concept car — a vehicle hailed as a “signature car” for Audi by Prof. Dr. Ulrich Hackenberg, Board Member for Development at Audi. There’s more than meets the eye, though. Be on the lookout for an Audi R8, A6 Hybrid and A3 as you watch the excitement unfold in Avengers: Age of Ultron, as well as an Audi TTS Roadster, R8 Spyder, Q7 and A8 during Spider-Man Homecoming — the first standalone film by our favorite web-slinger since he became involved in the Marvel Cinematic Universe. Taking a step back from the Marvel Universe, the German brand is also spotted in other film adaptations of comic book heroes. An R8 Spyder feature in Wolverine — the titular protagonist’s actor Hugh Jackman even turned up at the London Leicester Square premiere of the film in the same car — and an A8 plays a role in the 2015 big screen edition of Fantastic Four. You also might’ve noticed the German manufacturer’s presence in all three film adaptations of E.L. James’ novels, which follow the relationship of business magnate Christian Grey and college graduate Anastasia Steele. What made this brand of car most attractive to the directors of this film? The brand’s multiple appearances came as a result of a partnership that was set up between Audi and Universal Pictures — a deal that Audi no doubt has relished seeing as the movie series has grossed over $1 billion across the globe! In the first film of the trilogy, movie fans will be able to spot an Audi S8 D4, a 2017 S7 and an R8 Spyder. In the sequel, Fifty Shades Darker, a set of Audi Q7 cars and an A3 took center stage, with both the R8 and Q7 returning when the franchise wrapped up last year with Fifty Shades Freed. To talk about Audi’s feature in Mission Impossible, let’s rewind back to the year 2000 and Mission: Impossible 2 to showcase how Audi has been featured in the hit movie series that has always starred Tom Cruise in the lead role of Ethan Hunt. In a thrilling part of the film, Hunt leads a mission to destroy a deadly biological weapon and finds himself in an exhilarating car chase with international thief Nyah Nordoff-Hall. Hunt is behind the wheel of a Porsche Boxster and Nordoff-Hall tries to hold him off while driving an Audi TT — suffice to say that the pursuit between the two German-made cars into oncoming traffic is filled with nail-biting and edge-of-your-seat drama! We couldn’t create an article about movies and cars without mentioning the Fast and Furious franchise. After all, this is a series that features street racing, heists, and espionage using all manners of vehicles, and has so far spanned eight main series entries and two additional short films — grossing in excess of $5 billion to date. Fans are continually impressed with films that come out as part of this movie set. In fact, a spin-off movie called Hobbs & Shaw is due for release this summer. Bringing a focus to Furious 7 now — a movie that clutched at the heartstrings as it was the final one to feature an appearance by series regular Paul Walker due to the actor being killed while the movie was still being filmed — is where you can see Audi appearing in the franchise. You can spot the Audi R8 when it competes in an exciting quarter-mile race against a classic Plymouth Barracuda in the early moments of the film. In the previously discussed films, the Audi’s that were featured are all models that exist. With I, ROBOT though, we’re taken to the future to see what Audi cars may potentially look like in years to come. Called the Audi RSQ, this concept vehicle represented the first time Audi had ever develop a car that was to be specifically used in a major Hollywood motion picture. This futuristic model boasted piloted driving which allowed Will Smith’s Chicago police detective character Del Spooner to press a button to enable the car to take control of the driving — no doubt an early vision of the autonomous driving concept that we are only just starting to see being trialed in real life. Those who take a ride in the RSQ are able to ride sideways and diagonal, while the use of balls instead of wheels was a quirky design touch. However, the typical single-frame grille and the presence of those four instantly recognizable silver rings let viewers clearly know that this car was without question an Audi. This article was created by Audi & VW service provider, Vindis.